Since 1991, Dayton Services has been providing outstanding service and sales to customers in the Austin area. You will receive respectful, courteous and professional service from each technician on our staff. We handle all makes and models, including Daikin, and feature high-efficiency replacement systems. We make an effort to go above and beyond expectations for customer service, so we offer 24 / 7 availability and free second opinions. In 2016, we proudly announced Dayton Services and the addition of residential plumbing and electrical service! Our goal remains the same, to provide unbeatable service at reasonable rates. Comments: Ricky as well as ladies in the office were very helpful and professional. Comments: Although I thought the price was a little high for changing a supply hose on the toilet, water tank mount, and stopping a leaky tub faucet, overall I was satisfied with the way eveything turned out. All was fixed and Geronimo the repair was very nice and professional. He and his assistant even put on plastic covers on their shoes to avoid soiling the carpet or floor. Very satisified with final outcome. Would probably use them again but would probably compare prices for same job a little bit more. Work Description: Josh came out the same day and made adjustments to the system. He gave me a quote for a new system and was very professional. I will be using the as soon as I have my payment in hand. 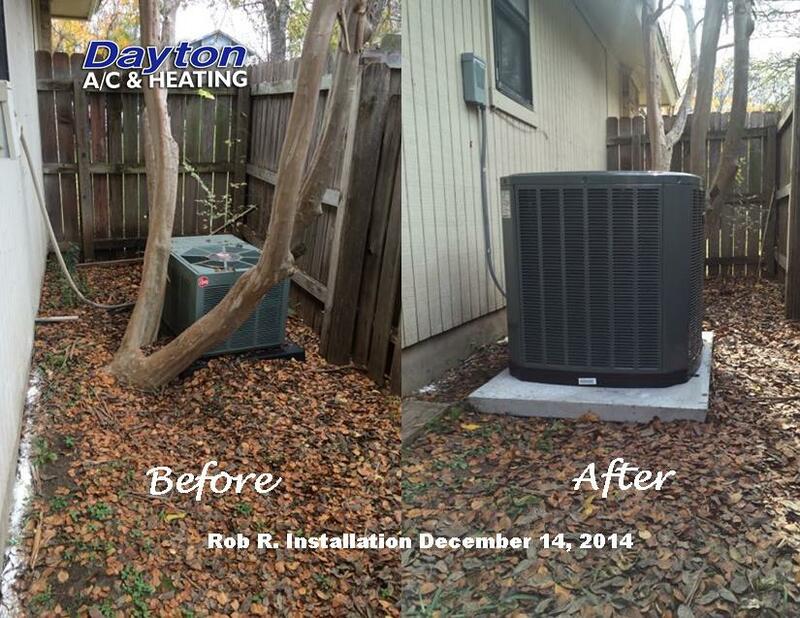 Work Description: Dayton Services replaced both AC/heating units in my home. The workmanship was very good and the installation team was outstanding. Comments: Even though the installation team was outstanding, I cannot say the same for Customer Service. Dayton Services has probably one of the worst Customer Service departments I've ever experienced. Work Description: Had a failing (large leak), very loud, and 15yr old r22 based 5ton Carrier system running dual zones that I needed replaced. Comments: Dayton was nothing short of excellent. I had never heard of them until doing some research on this random HVAC site and I saw this Networx form. I filled it out figuring what the heck, I was stressed out at the cost and didn't know who's bid to go with. Dayton contacted me and the choice became immediately clear. I looked them up and they had excellent google reviews. Every person we dealt with was very professional and courteous. My wife said she had a great feeling about them from the beginning. They were there the same day I submitted the form and installing the next day! My wife has a cake business and getting the AC running ASAP was critical as this happened early in the week and we needed things fixed by the weekend. They pointed out problems with out existing system and were very clear in explaining everything and answering my technical questions :). I had some pretty good knowledge of my existing system, basically knew what I wanted, and made some modifications to the recommendations to bring their estimate inline with other bids I had. We had the largest residential system you could have (5 ton) and a difficult install since it’s upstairs. They were very neat and cleaned up perfectly. Coy, the owner called me and displayed extreme generosity, we ended up with a way better system than planned for the same amount of money and they even replaced our incompatible zone dampers! We were blown away by this company, they went above and beyond what they were asked to do and did an excellent job. To top it all off, they offer a 12yr warranty on the Daicon systems they sell..12 years which includes them coming once a year, no extra charge! No other company could touch this. The system is way quiter and cleanly installed. I can’t say enough good things about Dayton. Call them if you’re having AC problems or if you need a new system, they will get you fixed up! Work Description: Connected an outdoor ceiling fan and associated switch. Comments: Service was prompt from setting up the call to the service technician. I would recommend their services!!! Work Description: Complete replacement of 28+ year old HVAC system + DUCT CLEANING STVC. Comments: Outstanding customer service and coordination/communication. The project was in Austin, TX and I was in ABQ, NM. Lorenzo (Contractor's Office) and the Customer Comfort Consultant (Brian Moran) were exceptional. 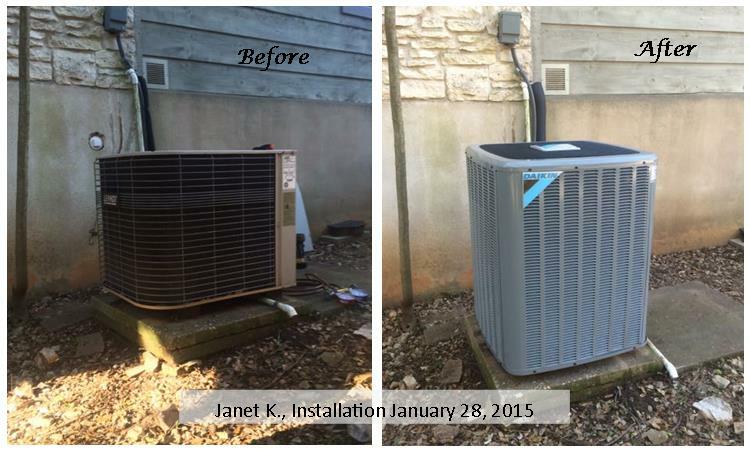 Work Description: Installed new 2.5 ton American Standard split unit with elect.heat strip. Comments: Great price. Signed contract Tuesday. System installed Wednesday. Arrived on time. Cleaned up wok area & hauled away old equip. Professional & efficient. I'd recommend them & I'll use them in the future. Work Description: Diagnosed Tankless water heater problem and then flushed it and cleaned it. Comments: Sean was punctual and knowledgeable about our tankless water heater. I also found him efficient as well. We would definitely have Sean back if needed. Comments: Sean was very professional and did an excellent job. Very pleased with his work. Comments: Quick and friendly. Got the job done. Comments: TOM HUTCHINSON WAS OUTSTANDING AND EDUCATIED ME ON A SAFETY ISSUES WITH MY MAIN ELECTRICAL PANEL BOX AND CONCERNS OF A POSSIBLE FIRE. Comments: My experience with Dayton A/C & Heating was so terrible that I filed a complaint with the Texas Department of Licensing and Regulation. The TDLR Enforcement Division considered the complaint significant enough to open an investigation (ACR20170023315). As of the writing of this review, the investigation is ongoing. I filed the complaint with TDLR because, when I questioned the quality of Dayton’s installation work in process, Dayton became hostile and threatened me. Also, I had the work inspected by several experts who said the work does not comply with standards, and it violates building code. Details are provided below. During the first day of work, Dayton employees began installing the line sets for the proposed HVAC equipment. After that first day of work, they did not return for a week. During that time, I examined their work, and became concerned over quality. I called to voice my concerns, and Dayton employees became aggressive, including Winston Coy Dayton, the company owner (TACLB00010288E). When he threatened to put a lien on my home, I ended the call. Coy immediately sent me several texts that claimed: I have no legal position to defend myself; he owns a large company with many lawyers who have never lost a lawsuit; and I cannot have an inspection performed on the work so far. Ironically, he even accused me of being a bully. In the days following, I had the work inspected by two inspection companies, the lead instructor at a local HVAC training and certification school, and a professional engineer. I also discussed the work with various individuals representing the manufacturer, relevant regulatory agencies, reputable HVAC service companies, and legal counsel. Those who personally inspected the work onsite described it as “unprofessional,” “poor workmanship,” “not educated,” “messy,” and “unskilled.” In addition, numerous contractors for other trades were onsite for our renovation project, and they invariably said the work was terrible. While the professional engineer was performing his inspection, he observed writing on the lines that was not relevant to this job, paint smears, along with the extensive damage. He wondered aloud whether these lines were not new but rather old material salvaged from a previous job. The various experts made the following claims: the work was not performed in compliance with manufacturer specifications or industry best practices; the work commits numerous building code violations; if the installation were completed, the system will not operate properly, and the lines will leak condensation water inside the drywall, causing property damage and creating a health risk; the only viable correction to the installed line sets is to completely remove and replace them. Also, Dayton’s planned method for installing drain lines would not comply with building code. In addition, the way Dayton chose to install their line sets makes installation for other components difficult to comply with building code, requiring more complex and expensive solutions. After receiving written reports from the experts, I sent to Dayton a letter that contained a summary of events, photos of the work, and the 56-page report by the professional engineer, which referenced the other two inspection reports. I provided those documents to TDLR for the complaint process. As suggested by my lawyer, I included with the letter a release that Dayton would sign to terminate the agreement and prevent him from harassing me further. Shocked at this outrageous behavior and anticipating that Dayton would treat other consumers so badly, and also fearing that Dayton would reuse these lines in yet another job, I filed the complaint with TDLR. Note that this work was performed in The Hills, TX. Unlike Austin, The Hills does not require permits or inspections for this type of work. Coming from Austin, Dayton knew this and apparently took advantage of the situation by sending unqualified employees to do unacceptable work. Comments: I wanted to give more stars but I can't as I feel a bit ripped off. First off, the staff were very kind from Denise, Michelle (I may have got this name wrong) and the two gentlemen who came out to my residence. The issue I was having was resolved which why those 2 things combined is why I give this 2 stars. I called with hopes to get a plumber to my house because a hair clog in one of my sinks causes my A/C condenser drain line to backup and overflow. To avoid this happening I wanted a plumber to just remove the clog. Thinking as I could have bought the 20-30 dollar metal snake and pulled it myself I wanted re-assurance that someone who has seen it before got everything. Originally I scheduled for 6pm on a Wednesday of which I was called and that was cancelled by the company (my A/C has been off to avoid overflow) the time was rescheduled for the next morning at 10am. I called the company at 10:50am as I have not heard anything from them as to their ETA. Upon arrival no estimate was discussed until the job was already underway at which I was told the pricing was 180. 15 minutes later the job is complete and the clog was easily removed. I'm dumbfounded as to where the logic that this job is worth 180 dollars. I personally feel ripped off as this was AT MOST a 100 dollar job, if that even. As I said, the company has nice employees which speaks a lot for them but make sure you get pricing for anything and everything up front before a job starts. Work Description: Replaced an overhead recessed light socket that I had broken removing the bulb. Comments: Louis Martin, Dayton Services, completed the work in 5 mins, he was very professional, friendly & did a great job. Louis is an EXCELLENT employee & represents Dayton Services well. Thank You for sending him to me. We will call on him again when we need Electrical Services. Work Description: Change out of heat pump system, duct sealing and cleaning. Comments: Totally professional from start to finish: on time, efficient, cleaned up afterward, and fully explained the system and how to use it. Comments: He showed the problem and also explained the cause, I was so relieved that was something easy to fix. 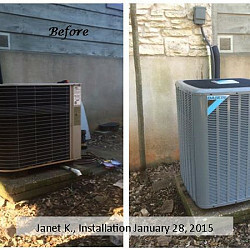 Work Description: Replaced two 16 years old AC with brand new DAIKIN DX16SA (2.5 and 3.0 ton) AC. 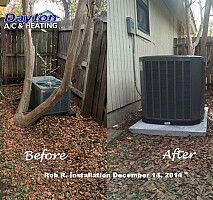 Comments: Dayton Air Conditioning & Heating team provided excellent service and performed outstanding job replacing downstairs and upstairs 16 years old AC unit with brand new AC less than 8hours. Convincing speech (technical/practical) from Owner and Sales rep, Great highly skill Staff, Excellent pricing and Great extended warranty were the primary reasons I used Dayton AC. Comments: Mr Dayton was the third bidder and was the most thorough in analyzing my specific criteria and designing a complete system to meet my unique application demands. Work Description: Inspection of AC and Heating systems. Comments: Mr. Dayton was very punctual , professional and took the time to explain the services needed in detail but in term I could understand. He was very professional and we will definitely use this company again in the future and recommend to our family and friends. Work Description: I have been using them for over 10 years on three of my homes. Comments: They have always been punctual. I found them the best in the market with the best quality of products.